Feldland is located centrally in Sobukand. It is bordered to the north east by the Dunbar Mountains and to the south west by Sorfjell Mountains. Holthar is to the North West and Ostsorjund and Ziel form its southern border. The land is characterized by grasslands that are fed by the waters of the Micelburn River, which runs its length. This region has the largest range in temperatures, ranging from hot and humid up near Holthar to cold down near Ostsorjund. One thing that dominates the whole area is wind. Because Feldland stretches across so much of Sobukand, it was fought over during the Kings Wars. The people from this region were often conscripted by the Northern Kingdoms or the Southern Kingdoms to fight in the wars. They were victimized by both sides and their resources and wealth were used to fund and feed the fighting factions. Many of the people were left to fend for themselves depending on exactly where they were in the region and the whim of the Kings at the time. During times of peace, Feldland was used as the meeting ground for diplomatic discourse. It is difficult to summarize the impacts that such outside actions have had on the people of Feldland. One lasting effect that is common among those from Feldland is a resentment of outside rule and distrust of rulers who have not earned their place or the respect of their people. With the creation of the Empire the elders and leaders from Feldland sought assurances from the Empresses that they would not follow in their father’s footsteps. Before signing on to the Empire they forced the creation of an advisory council and gained representation on this council for themselves and for each other Region that would join the Empire. Now the people of Feldland are rebounding and reclaiming their place on Sobukand, but the healing of the people and of their land will still take time. Outside of being absorbed by separate kingdoms at different times, the Feldland governs itself in a very local, community based, manner. Even in the larger cities, there is a council of elders or respected community members established to make sure that the people and their culture are lawful and prosperous. The councils are often chosen by competition with the strongest, smartest, and most fair winning places on the ruling body. 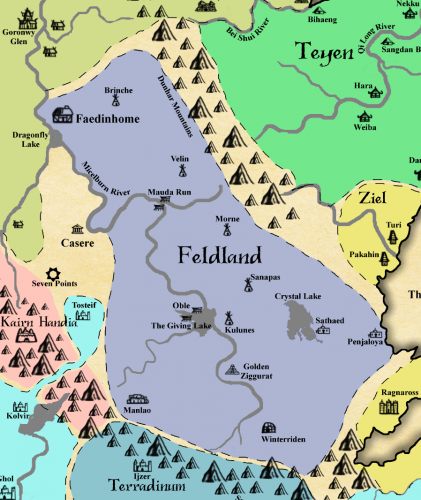 There are some large cities across Feldland, but many of the peoples live a nomadic life, following the ebb and flow of the Micelburn River or travelling with their herds. This nomadic lifestyle has caused the people to be very efficient with their possessions. Things that cannot be made portable are often left behind or not sought after in the first place. Major cities in the Feldland are: Faedinhome, Casere, Manlao, Kulunes, Penjaloya, Winterriden, and The Golden Ziggurat. Faedinhome is one of the oldest cities on Sobukand though it is not known how old it actually is. People of Faedin ancestry consider this to be their ancestral home. Most of the people from Feldland journey to the city of Faedinhome at some point between their 15th and 20th naming day in order to participate in a coming of age Spirit Binding ritual. The Spirit Bound then return home and often take on a new name. They are welcomed back as a mixture of who they were and who they are becoming. Other major cities will also hold these rituals, but Faedinhome is where most folk from Feldland hope to have their rituals performed. When the Empire was formed; both Empresses decided that it would be best for them to locate their residence central between their former Kingdoms in the Kings Wars. With advice from the leader of Feldland they chose a location for their home and had a modest (by a King’s standard) castle built in which to live. Thus the city of Casere was formed. Casere is situated on a bend of the Micelburn River and is one of the better places for farmland, as this area has major floods every five years or so. Since the bend is closer to the mountains of Kairn Handia, snowmelt adds to the shifting of the river and increases the flooding which brings rich soil for farming. When the larger floods occur, farmers take advantage of the temporary marshes that are created and grow rice. In other years, they grow grains and other crops. This city was built as the Imperial Seat and the Empresses maintain their residence here. Technically the land around Casere is Imperial land but in many ways it is still treated as part of the Feldland too. Kulunes is a city that is situated between the Giving Lake on the Micelburn River and the Crystal Lake. This city was traded, overtaken, and reclaimed by many members of the Five Kingdoms because of its situation next to so much fresh water. This history of changing ownership has left an interesting mish-mash of architecture in place. Holthar and Sorjund each had imported building supplies during their occupations and as a result, Kulunes is one of the few cities in Feldland with buildings constructed from wood, stone, and reeds. Kulunes is renouned for the bounty of the fresh water fish from The Giving Lake. Manlao is an older city in the south of the Feldland region. It had never been a very peaceful place because of its proximity to Terradinum. During the Kings Wars, it was thought that this city could be used to gain power over Terradinum. However, every attempt at using Manlao to cut off supplies, threaten the borders, or use as a stronghold failed, often as a result of sabotage or raids. Penjaloya is the only coastal city in Feldland. It was an important city during the Kings Wars because it was one way for people and supplies to leave from and return to the Feldland. Now, it is a peaceful port city that supplies treasures from the sea to the central most part of the region. Winterriden is the southernmost city of Feldland. This city is situated near the source of the Micelburn and is the key point of trade with the southern regions for sending goods north along the river. The farming season here is short, but there are hearty varieties of crops that do well even into the colder months. Although this area is colder, it still produces nourishing grasses that sustain a variety of herd animals. Certain ailments related to heat are said to be cured by staying through the Winter months here and some say that is where the name of the city comes from. Golden Ziggurat is where there was a discovery of gold and other precious metals that washed down out of the Sorfjell Mountains. The waters of the Micelburn run rapid just until they hit the first curve. Here, the river widens and there are large areas of shallows which allowed people to find chunks of gold and other metals. This is the wealthiest city of Feldland. The shallow areas, however, make running barges difficult during the dry summer months. When the spring thaw occurs, flooding is prevalent and can make traversing the bend in the river treacherous. During the Kings Wars, the area around present day Casere and the mountains of Kairn Handia sustained the bulk of the fighting. All of the bloodiest battles were fought here and the land became scarred and stained. A few decades before the Empire was formed, during one of the short lived truces of the Kings Wars, the people of Feldland came together and erected seven standing stones in a ritual attempt to heal the land and the area around these stones came to be known as Seven Points. When the empire was formed, a central, neutral, location was selected to be the new Imperial capital. The city of Casere was thus established. The ritualists of Casere could see how badly the spirit of the land was damaged and so they encouraged more people to attend to healing rituals at Seven Points. Every year, hundreds of people come to this area during the Summer Solstice to perform rituals of healing. The Micelburn River has major floods about every five years or so. Because of this, the people who live there exist more according to what the river is doing than anything else. Families and towns will settle in the wake of the floods to take advantage of the fertile soil deposited from the riverbanks. Depending on the size of the flood, these farmlands may produce for three to five years. When the soil nutrients are depleted, people move beyond the river to take advantage of other resources. Some families migrate from the river to one of the lakes until the next great flooding. Also, nearly every adult in this region is spirit bound. When youths come of age, usually between fifteen and twenty summers, they leave their family for a year to explore the region and learn things outside of what their village can teach. As the year of learning comes to a close, they travel down the Micelburn toward Faedinhome to undergo the ritual for Spirit Binding. Feldland supports extensive grassland which is good grazing for animals, from sheep and goats to buffalo and cows. There are also many varieties of horses bred and used for herding. As such, meat is a large staple of this region’s diet. Fish from the Micelburn feed the nomadic villages when the flooding has passed. Farmed crops include wheat, barley (more to the south), rice (grown in the flooded seasons), oats, root vegetables, berries, and a wide variety of herbs. Chickens, ducks and other gamefowl are also popular as they inhabit the lake areas and grasslands. From the grains, Feldland produces breads, cakes, and noodles in as many varieties as a person can imagine. Coffee beans are cultivated in the northern part of the Dunbar Mountains along with a few varieties of tea. Hot weather of the north makes for light weight clothing. Garments are made of leather and fabrics including cotton, linen, and some silk. Straw hats and hats in general are popular to protect people from the sun. The colder southern areas favor heavy cottons and wool. Gold and Silver jewelry made from the metals found at the Golden Ziggurat are worn to display wealth. Metal jewelry is often decorated with colorful stones and worn as armbands, necklaces, earrings, anklets, and adornments on clothing. During times of ritual and Holy days, people will be found wearing brightly colored body paint with mystical, elemental, or ancestor spirit meaning. The prevalent colors of clothing, tents, and jewelry tend to be: Tan, Gold, Silver, Bright Blue, Emerald Green, Rust, and Black. Although Feldland encompasses a large area with diverse temperatures, there is a consistency in how the people live here. Villages come together for mutual protection, to gather crops, and to raise children. Outsiders are not trusted initially but once proven to be peaceful can be taken in like family. Shared experiences in lean seasons lead to shared riches when the flood waters provide. Because of their nomadic nature, the people of the Feldlands rely on simple tools for their living. Guns are relatively rare unless in a city or owned by a member to a town or city’s guard. Swords, knives, and farming tools are very common. Trees are rare in this region. There are some that grow along the two lakes; but the annual Micelburn floods are too much for trees to get a good root system along its banks. This means that most wooden tools are imported or are made from smaller plants lashed together. Reeds are often used in place of wooden handles. Bamboo is found more in the northern part of this region as well. Metals are dug up in shallow pits or are panned from shallow areas along the Micelburn River. The metals are heated and turned into bronze tools for the majority of things. It is not uncommon to find a poor farmer with a bronze pitchfork who lashes together reeds to make a handle. Because the Micelburn is central to life in Feldland, river boating skills here are the best in the world. The citizens’ ability to build structures that survive floods or just exist on top of the lakes and rivers is not to be beaten. Feldlanders enjoy a variety of things for entertainment. They love to dance, and dancing is part of many rituals. Music from this region usually involves gourds, drums, and reed instruments. Naming - People in the Feldland are named after omens of their birth or after their parents. For example: Little Fish son of Two Fish. Two Fish might be a married couple who are referred to as a unit. The father might have been known as Kingfisher and the mother might have been known as Jumping Fish. When they married the family unit became Two Fish and their offspring might be Big Fish and Little Fish. Guardian spirit names can be incorporated into personal names as well. Outsiders - Although Feldlanders are cautious when new people or outsiders approach, they never turn down a plea for help. Along with that, they will not ask for help unless it is truly needed. Because of the tradition of traveling the river for the spirit binding ritual, when the young people travel up river or anywhere in the Feldlands, they know that every city, village, town and family will make room for them to stay as they make their journey. Shared Meals - The sharing of food in a community is very important, especially at breakfast before the heat of the day. To eat with someone at the rising of the sun is to be at peace with them for the day. Weddings are performed at sunrise. Children are named the sunrise after they are born. Death - When a person dies, the family and friends gather at the next sunset to perform the funeral rituals. The community gathers and they speak briefly about the deceased, then as a group, they recite words inviting the Ancestor Spirit to leave the body and move on. The body is then placed on an elevated platform and the elements are allowed to reclaim the body. Although the people of Feldland ebb and flow with the Micelburn, the platforms are located in a place that does not move with the people. During the King’s Wars, platforms were not easily erected in a fast manner. Instead, they took field stone and built rock platforms, just a few inches tall, so that the bodies did not lay on the ground. Some of these areas can still be found as grim reminders of battles both ancient and not so distant.